Dan Dare Annual 1987 opens with the quote "Come along, my intrepid explorer, and set foot on virgin soil" from one of the 1951 weekly comics. The work of Frank Bellamy, Frank Hampson, Don Harley, Harold Johns & Greta Tomlinson, Keith Watson, Gerry Embleton, Ian Kennedy and Carlos Cruz is reviewed, highlighting the differing styles used by each and showing the evolution of the comic and annuals through the years. Also featured are the usual set of foes, including the Mekon. Dimensions : 19cm x 27cm with 95 pages. Learn the words to the S.P.S. Anthem, sung to the tune of the Lincolnshire Poacher's song. 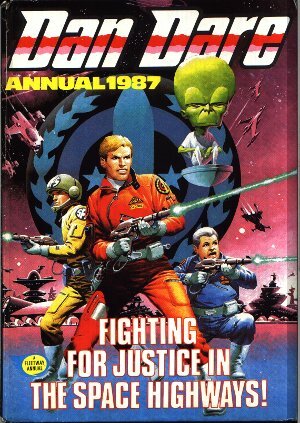 Dan Dare - This is Your Life - a potted history of our hero.